Sometimes seniors have difficulty maintaining good oral hygiene. This can be because of manual dexterity issues due to arthritis in the hands. Other times, it can be because of cognitive decline. 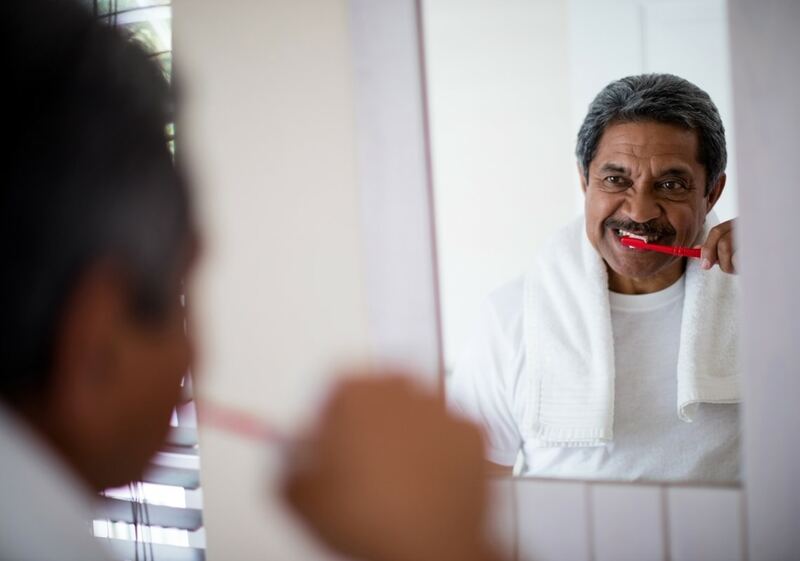 Seniors with dementia often forget how to do everyday tasks, including brushing their teeth. When seniors cannot brush their own teeth, it falls on family caregivers and home care services providers to assist them. Though brushing your own teeth may be simple, it’s not quite so easy to brush someone else’s teeth. The right toothbrush can make a big difference in making brushing more comfortable. Choose a soft bristled brush that will be gentler on gums. Also, look for a brush that is easy to hold. If the senior is still capable of brushing but has difficulty holding the brush because of grip issues, an occupational therapist may be able to recommend an adapted brush or a device that can be added to a regular toothbrush. Although toothpaste can help keep teeth healthier, it’s really the brushing itself that removes most of the plaque from teeth. Sometimes seniors find the taste of toothpaste too strong or unappealing. Use a small amount of toothpaste or, if the senior cannot tolerate it, don’t use toothpaste at all. There’s no rule that says teeth must always be brushed at the bathroom sink. If it’s easier to have the senior sit at a table, that’s fine. You can place a towel over the edge of the table to make it comfortable to lean against. A cup and bowl will work well for rinsing and spitting. Step 1. If the senior is right-handed, stand on their right side. If they are left-handed, stand on their left side. Step 2. Hold and control the toothbrush, but have the senior place their hand over yours so that it feels as though they are brushing their own teeth. Step 3. Place your empty hand on the senior’s shoulder and press gently. The pressure fools the brain into forgetting what is going on in their mouth and prevents them from pulling away. If the senior in your life needs assistance with daily tasks like brushing their teeth, hiring a home care services provider can help. With the help of a home care services provider, older adults can age in place rather than having to move into a long-term care facility. Home care services providers can help with daily care tasks, such as bathing, grooming, dressing, and brushing teeth. They can also help by doing things around the house that can get difficult with old age, including light house cleaning, laundry, and preparing meals. If you or an aging loved one are considering personal care services, contact the caring staff at Sonas Home Health Care. Call (888) 592-5855 today.